An old variety of annual that seems to always stay pest free and produces these beautiful arrays of dark purple blooms most of the summer. Grandpa Ott is perfect for fences, walls, mailboxes, lampposts, unsightly tree stumps, and good old trellises and arbors! It can either climb or ramble across the ground, with fresh foliage as a backdrop to the masses of showy 2 1/2-inch blooms. 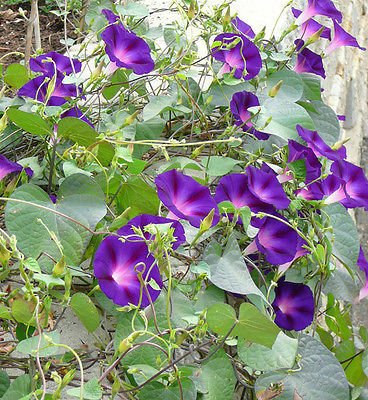 Thriving in full sun, this vine loves ordinary to dry soil, and will really take off in sandy soils. It is super-easy and fast to grow -- just direct-sow the seeds when the soil warms up in spring, and before you know it you'll be staring in wonder at these delightful blooms. You can even train it up a trellis inside a container or let it trail from a hanging basket! Grandpa Ott begins blooming when the summer heat arrives, and won't quit until the first cold snap of fall.